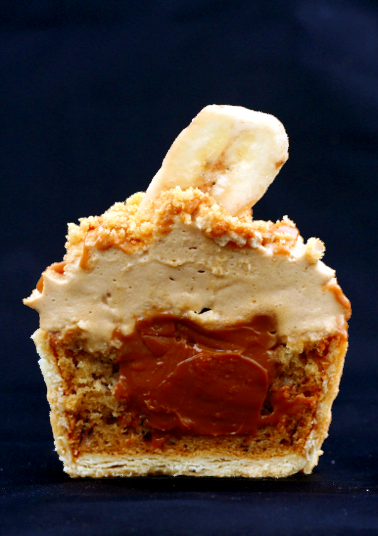 Here’s a different take on a classic recipe – Banoffi Pie Cupcakes! Banoffi Pie itself evolved as a variation of the American dessert pie known as Blum’s Coffee Toffee Pie. At The Hungry Monk Restaurant in Sussex, the original notoriously problematic caramel filling was easily created by boiling unopened tins of sweetened condensed milk, which unfailingly produces a deep, flavoursome caramel every time. Adding a layer of bananas created the classic dessert we know today. Banoffi Pie was on the menu of the first bistro I worked in (as a waitress), and it was also the first ‘professional’ dessert I managed to recreate myself. Once you know the secret of making the filling, it’s an absolute breeze to whip up – I always have 1 or 2 tins of caramel in my cupboard in case a dessert is needed at short notice. The original recipe called for unopened tins of condensed milk to be simmered for 4 hours – which was this dessert’s only drawback. A beady eye had to be kept on the saucepan, to ensure that it didn’t boil dry, because that way lay exploding tins and rains of boiling caramel. There are many alternative methods for making the caramel out there on the internet, and you can even buy tins of caramel ready made (in the UK its made by Carnation) – but they are twice the price of condensed milk and are a poor relation in terms of both flavour and consistency to the caramel you can make yourself. By far the safest, easiest and most foolproof method of making your own caramel filling is in the slow cooker (see below). I’ve been messing about with the idea of making this classic dessert into a cupcake for quite some time, and there have been several versions along the way. This version is the one I’m most happy with: it’s faithful to the original, yet serves up all the flavours in cupcake size. A light and fluffy banana cake mixture is baked in a shortcrust pastry case, filled with caramel and topped with an unsweetened coffee-flavoured cream – the pastry and the coffee cream help offset the sweetness of the cake and the caramel. Delish! Take as many tins of sweetened, condensed milk as you wish to turn into caramel and place them in your slow cooker. Put on the lid and switch on the cooker to Low. Leave overnight (8-12 hours, depending on how dark you like your caramel). In the morning, switch off the cooker. Using tongs, remove the tins and set aside to cool. DO NOT OPEN until the tins have cooled completely. The contents will be boiling hot and under pressure, and burns WILL result. Be sure to label these tins as caramel, as they will be virtually indistinguishable from uncooked tins. You will need 1 tin for 12 Banoffi Pie cupcakes. Put the butter, flour and sugar into a food processor and blitz until the mixture resembles breadcrumbs. Put the ice water in a jug/bowl on the work surface. With the food processor running, add 1 tablespoon of ice water at a time until the mix comes together. NB Do not pour ice water straight into the mix, as it is easy to add too much. The time it takes to add the next spoonful of water after the first means that the machine can mix the water in properly. Continue to add water one spoonful at a time. When sufficient liquid has been added, the mixture will come together in a ball. Tip out the pastry and knead lightly until smooth – about 1 minute. Wrap in plastic film and chill for 30 minutes. Once chilled, roll pastry out thinly and cut out rounds using a pastry cutter. Use the circles of pastry to line a well-greased 12 cup muffin tin. NB Because I wanted the pastry to be smooth all the way round, I actually made a template based on the size of my muffin cups. To make your own template, take a piece of kitchen foil and press it firmly into one of the holes in your muffin tray until it fits snugly against the sides and bottom. Remove the foil and use a pair of scissors to cut down the side of the foil and around the base to make a curved ‘wall’ template and a circular ‘base’ template. Put the lined muffin tray in the fridge to chill whilst you mix the banana cake. Cream the margarine and the sugar until fluffy. Add the eggs one at a time, mixing the first in well before adding the second. Add the mashed bananas and the yoghurt and mix thoroughly. Mix the flour, bicarbonate and baking powder and add to the wet ingredients a spoonful at a time. Stop mixing when fully combined. Spoon into the prepared muffin tin, filling each pastry case 3/4 full. NB A quarter-cup measure can be useful if, like me, you have a rather deep muffin tin. Depending on the size and juiciness of your bananas, this might make more batter than is required. Have some paper cases set out in a second pan ready to take any leftover cake batter – they can all bake at the same time. Bake for 10 minutes, then tun the pan 180 degrees, to ensure even browning. Cook for a further 7-10 minutes until a toothpick inserted into the cakes comes out clean. Remove the cakes from the tin and leave to cool on a wire rack. Add coffee powder to cream and whip until stiff. Using a sharp knife, cut out a cone of cake from each cupcake and discard. Fill the hole with caramel – 1 teaspoon should be sufficient. Fill a piping bag fitted with a star tip with the coffee cream and pipe swirls on top of each cupcake. Make sure to cover the caramel filling completely. Using the leftover caramel, mix with a little milk until of a pouring consistency. Drizzle caramel over the piped cream. Sprinkle with biscuit crumbs and top with a banana chip. These look very very decadent but very very good <>! Mary-Anne you blow me away nearly everytime (yes this IS one of those times). The colours and layers and textures and flavours and everything else – love it! What a great recipe – can’t wait to wow people with it. Love the idea of making the caramel in the slow cooker. I presume the caramel will keep for a while as long as the tin isn’t opened? Thanks again. I’m helping with a coffee morning for MacMillan Cancer Care on 30th September and these will definately be my contribution to the event. Hi Mary-Ann. Thanks for sharing this recipe. My colleaques, husband and I liked this creation very must. You a my favorit in the GBBO. Greetz Johanna. Wow Mary-Ann this look fantastic. I make Banoffi Muffins but a Gluten free one as my husband has a wheat allegy. 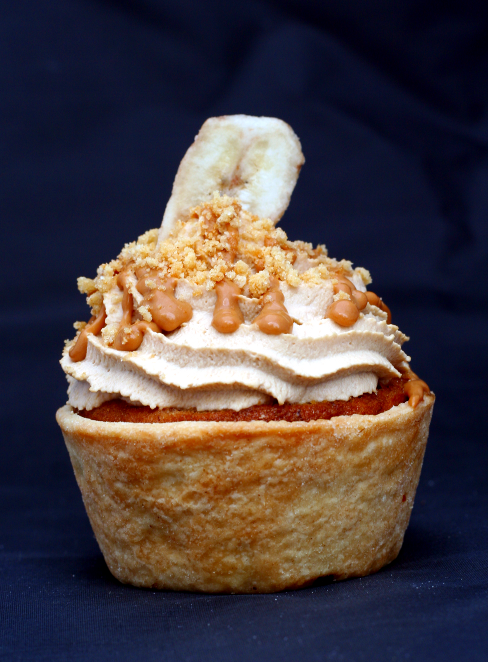 It is a banana muffin with caramel swirled in it and topped with pecans. I changed it slightly by putting in a filling of butterscotch marshmallow buttercream and a dollop of caramel and put the top back. My friends and husband love them. Hi there. I notice that you use Stork rather than butter for the cake, is there a reason for this? Also do you use the soft stuff or the harder block margarine? I so enjoyed the programme and laughed out loud when you put your daughters name on the Sacher Torte! The recipe looks great – any tips on how to make the caramel WITHOUT the aid of a slow cooker (I don’t have one!). Thanks. Great – thanks very much Mary-Anne – you’re the queen of baking as far as I’m concerned! 2. Practically EVERY contestant on the gbbo commented on this !! !